Cloudy during the morning and into the early afternoon with intermittent light rain. 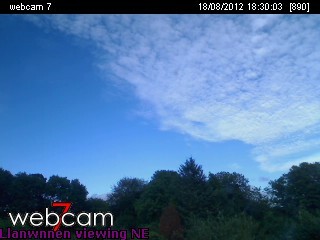 The rain cleared by 1330 g.m.t and the cloud gradually broke to leave a mainly sunny, and warm, end to the day. 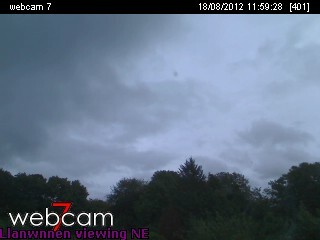 No rain so far since 9GMT. Cheered up this afternoon with blue sky and warmth. Temp got to 20.3C. Alas wet weather signs are about. Could hear conversations from neighbouring farm to the west half a mile off. The M6 10 miles away has been humming all afternoon and still at it. 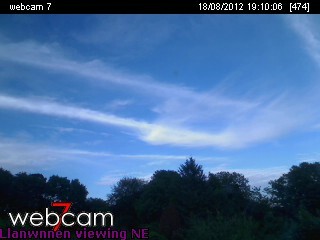 Clear sky been nobbled by a great deal of expanded contrail mush, some cirrus and some patches of floccus. And low down in the south west and west a wall of grey cloud approaches. Got that sinking feeling here in Bog-land. 21.7C, clear skies, wind light, 1015hPa. Cloudy, warm and humid last night with spells of light rain and drizzle. Mainly cloudy to 1300 with a little drizzle at times this morning. 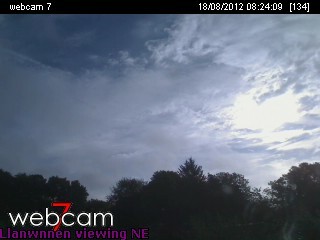 Sunny periods after 1330. Warm and humid. Light to moderate southerly breeze.